The success of sailing as a recreational and rehabilitation program for the disabled is evident in the growing number of people that participate in our program and other programs throughout the world. Our Canadian waters serve as great healers and equalizers; people with mobility and other impairments can leave their wheelchairs and their disabilities behind, and enjoy the independence and freedom that one experiences when sailing. Recreational sailing times are available from 11:00 AM to 5:30 PM on Wednesdays to Sunday’s – each 1.5 hour sail costs $15.00 inclusive for members. Special Events, such as Canada Day and our Around the Island sails and BBQ’s run periodically throughout the summer. 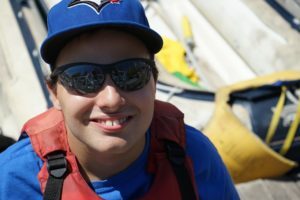 DSAO Toronto is pleased to offer organizations which serve people with disabilities the opportunity to bring groups to the waterfront for a sail. Please contact us at 416-214-0358 or by email: [email protected] to book your sail outing. GOB will be running July 9,10,16,17,23,24 and August 6, 7, 13, 14, 20, 21 from 1:30 PM – 5:00 PM. Participants intending to sign-up should do so when Membership sign-up occurs. A new program especially dedicated to Seniors will be running July 9, 10, 16, 17, 23, 24 and August 6, 7, 13, 14, 20, 21 from 11:00 PM – 1:00 PM. More details to follow. Sailing is a very safe sport as long as you use good judgment and obey a few basic safety rules. All our recreational sailing is supervised by a qualified instructor or volunteer. Here are a few things to think about when preparing for your sail. Dressing for Safety and Comfort: Always dress knowing it is a little cooler on the water. Long pants and shirts are recommended to protect from sun exposure. A rain jacket or rain cape makes sailing in windy and wet weather more comfortable. Our program provides approved PFD (personal flotation device) to all participants. Protection from the Sun and Over Heating: Any exposure to the sun directly and from the reflection of the water puts sailors at serious risk of sunburn and dehydration. Bring a hat with a brim and protect any exposed skin with sunblock. Wear sunglasses to protect your eyes. Stay Hydrated: Drinks lot’s of water before and after your sail to stay hydrated.